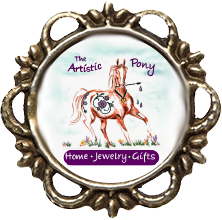 The Artistic Pony Studio, Ltd. opened its doors in August of 2006. Probably not the best time to start a retail business! But here we are. Through the best times and the worst, our clients have not only supported us but many have become dear friends. There have been a lot of changes over the past few years but we are looking toward the future and are finding that even through personal challenges, artists are expressing themselves and the times we find ourselves in are filled with imagination, beauty and a wonderful resilience. We are very pleased to be able to bring to you a truly amazing collection of talent and at prices that make treating yourself once in a while possible. Why not, you certainly deserve it!